This landmark publication covers the Irish revolution 1913-23 in one thousand pages with contributions from over one hundred historians. Featuring over three hundred original maps it details how topology and location played such an important part in this complex conflict. 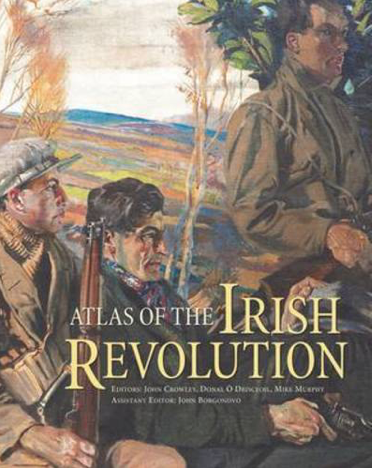 This book places the Irish revolution in its international context with telling use of several hundred illustrations, and reproductions of rarely seen key documents. It analyses the political and social changes which shaped modern Ireland and details the unspectacular aspects of ordinary Irish life. It will have wide appeal to a specialist and popular readership. The ballad or narrative song has played an influential role in both the shaping of popular memory and the humanising of key historical events. ‘Grace’ was jointly composed in 1985 by the brothers Frank and Seán O’Meara and popularised subsequently the singer Jim McCann. 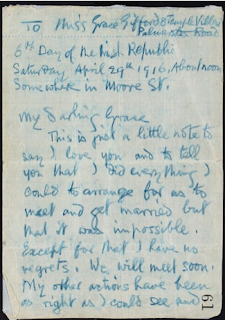 It tells the story of the marriage of the marriage of Joseph Mary Plunkett and Grace Gifford in Kilmainham Gaol shortly before Plunkett’s execution. The tenderness and poignancy of that moment is captured in lyrics that have resonated with the public ever since. 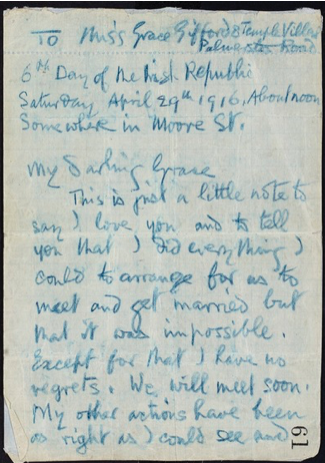 Joseph’s love for Grace is manifest in a letter (above) written in Moore Street on the ‘sixth day of the Irish Republic’ where he leaves all his possession to her. Their short and intense courtship would be brought to a dramatic end by the events of Easter Week. The centenary commemoration of the Rising showed a willingness by the public to engage with and understand the 1916 participants on their own terms. So how many active volunteers were there in Dublin during this period? Oscar Traynor who took over the brigade on the deaths of McKee and Clancy, put the number at 1,250. The approximate strength of the various Battalions in early 1921 was 1st Battalion: 250; 2nd Battalion: 250; 3rd Battalion: 250; 4th Battalion: 300; 5th, or Engineers’, Battalion: 100. This was the active membership ‘or the strength that was given by the Battalions as being on parade each month’. The 5th Battalion looked after other specialist activities, such as engineering, logistics and first aid. The most common form of transport for arms was the lowly handcart, notwithstanding folklore about pregnant women, prams and hearses. By the time of the Truce, every ASU included trained medical orderlies. Volunteers’ membership of the St. John’s Ambulance and the Dublin Fire Brigade provided useful logistical and intelligence resources, as did the large number of Volunteers working in Dublin Port and the railways. It was through this network that the Volunteers were able to ambush trains on which troops were travelling to and from the city.